Before I go into how the Earth Grid works, we have to start by visualizing how energy flows. Because gravity affects everything, nothing flows in a straight line. Everything curves and bends, even light and time, due to the forces of Gravity, which is how the Tao moves and shapes everything. The knowledge has been placed out in the open for a very long time. We just never really understood what we were looking at. Anyway, I digress…the above picture shows a Chinese Foo Lion with his paw on top of a ball which has the grid lines of the famous Flower of Life pattern. This is a very ancient 3D model of how the Earth’s energy patterns flow, and it shows that the ancient masters knew quite a bit about the Earth’s geometry. Over time, the information became mystified and deified, eventually losing its connection with science, turning into mythology. 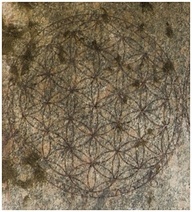 Go to Egypt, around the same time period, and we find another Flower of Life pattern that has been laser-etched into a rock wall. Don’t ask me how they got a laser etching machine back in those days. Just accept the fact that it is a laser etching in solid rock. It shows that they also knew about this, so the knowledge was smeared around, it wasn’t just localized to one area. We all got the scoop at around the same time-frame. To confirm the knowledge, our very own professors of science have drawn on their planetary ‘chalk board’ how the image would look, when simplified so that a first-grader could comprehend the geometry (which is, by the way, where we are at the moment…first grade…we graduated from kindergarten to first grade when we initially figured out how to make the first atomic bomb). Imagine a core rotating inside the Earth, at a different speed from the crust of the Earth. This core is a body-centered CUBIC CRYSTAL structure called quasicrystal. They are created by supercooling a combination of metals, very quickly. Because atoms are sometimes wave-like and sometimes particle-like, when the crystal is frozen very very quickly, it captures the crystal with the atoms in both states of wave and particle, at the same time. What’s wicked about all this is that this quasicrystal is not some theoretical possibility or mythical unicorn type structure. It actually exists! This is a quasicrystal, shown in a dodecahedron shape, which will be important later on in the post. Just bear up with me for now. “We found that the body-centered cubic structure of iron is the only structure that could correspond to the experimental observations.” ~ Börje Johansson, Professor of Condensed-matter Theory Uppsala University. Despite its high degree of symmetry, it manifests a surprisingly high level of elastic anisotropy. In other words, it gives off measurably unequal physical properties along different axes which shows that its elastic properties are contingent on direction. A spherical body would not have these lines of axes radiating out from the center in a cubic fashion. This is how Earth’s energy knows where and how to flow so that it looks like a square, yet without any corners. This is one of my bucket list questions that have been solved, and this is how it works. This is Kepler’s Platonic solid model of planetary spacing in the Solar system. It is divided evenly into a grid work of intersecting octahedron, tetrahedron, icosahedrons, and dodecahedral configuration. This geometry doesn’t just apply to solar-systems, it also applies to the individual planets themselves. (By the way, this geometric structure goes even farther, down into the atomic levels of matter and our DNA, but that’s another post for another day. Today, I am going to focus in on what makes Earth Navels). Where the vertices connect, there is a strong gravitational-electro-magnetic (GEM) field being generated. If we can find one of these grid points, we can find all of them by simply laying down the grid with one of the vertices directly on top of the grid point. If we rotate the other vertices around that one central point, we will come up with all the other grid points. There is a method to the madness, however, and rather than start from scratch, we can follow the works of others who have come before us, to figure out the geometry of it all. The idea of the Earth as a geometric shape goes back in history at least to the Pythagorean school of thinking in ancient Greece. Its famous adherent, Plato, wrote that ‘the earth, viewed from above, resembles a ball sewn from twelve pieces of skin. When you place within the earth, a tetrahedron with its vertex at the north pole, it has the other three points touching at 19.47 degrees south of the equator. 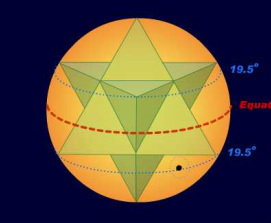 The points of the bases of the two tetrahedrons touch an enclosing sphere at 19.47 degrees. At each planet’s 19.47 degree latitudes we have the intersection between the light body of the planet and its surface. The major intersection on Earth falls directly over Kilauea, which is considered to be the most active volcano in the world. This is not an isolated case for just Earth alone. At these same latitudes on other planets, we find the massive volcanoes on Mars, the great red spot of Jupiter, two volcanoes on Venus, a dark spot on Neptune, dark cloud bands on Saturn, and that hot spot is also where sun spots occur on the sun. If you notice, this ‘hot spot’, which is in our northern hemisphere, corresponds with that of Jupiter’s Red Spot, which is in the southern hemisphere of Jupiter. This is because we are looking at Earth with North pointing to the wrong direction. Geo-magnetically, it should be viewed this direction. But that is just one of the basic geometries that can be found within the sphere of Earth. Its counterpart is yet another tetrahedron which is an exact inverted replica of itself. Here is what it looks like. It shows up as that ubiquitous Star of David, which is basically a flat 2D view of two pyramids, centered and intersecting each other. More on this ‘Star of David’ in future postings. For now, I just want to get the point across that we can figure out where the Hot Spots are, so that we can find our Navels more easily. Onward to the first Navel that started it all, back in my early formative years, Te-Pito-o-te-Hanua. ** Unified Vector Geometry 120 Polyhedron or the UVG120 ‘Earth Star’.